In this article titled, Sandy Hook Evidence:Strange Victim Photo Dates, we’ll take a look at photos found on a couple of international photo repositories, AP Images and SIPA Press. The Associated Press is a multinational non-profit news agency based in New York City. The AP is a nonprofit cooperative owned by its contributing newspapers, radio, and television stations in the United States, all of which contribute stories to the AP and use material written by its staff journalists. Many newspapers and broadcasters outside the United States are AP subscribers, paying a fee to use AP material without being contributing members of the cooperative. As of 2005, the news collected by the AP is published and republished by more than 1,700 newspapers, in addition to more than 5,001 television and radio broadcasters. The photograph library of the AP consists of over 10 million images. The Associated Press operates 243 news bureaus, and it serves at least 120 countries, with an international staff located worldwide. The Associated press is an historic and venerated institution founded in 1846. They’ve been involved in the news gathering game for a long time. It’s all they do. They should have a pretty good handle on the process by now. As mentioned, as a co-operative they source their material from people and organizations all over the world. But they also have writers and photographers on staff, a few of whom were in Sandy Hook on 12/14/12. AP Images. Unfortunately, unlike “many newspapers and broadcasters”, we aren’t financially fortunate enough to have a subscription to AP Images. Without a subscription you can only view small versions of the photos which are rarely useful for investigative purposes. As such I have spent absolutely no time there in my hunt for photos pertaining to Sandy Hook. This week I got stuck looking for an aerial photo of the Lanza, Yogananda St. home so I decided to head over to AP Images to see if I could at least find a small version to verify a suspicion. As one can tell from a cursory search of photos on the AP Images site they are listed chronologically, oldest to newest or newest to oldest depending on your prefered selection. I searched for “Sandy Hook”, went to the oldest search results and worked my way forward. What I found during my search was confusing, to say the least. The first familiar photos I came across were of Avielle Richman and Josephine Gay. The only problem was their pictures had chronological upload dates of 12/13/2009 and 8/8/2010 respectively. Then I found another photo of Avielle dated 8/27/12 and then a picture of Victoria Soto dated 11/23/12. Click on any of the banners for a larger image. Your first reaction to these dates may be the same as mine. My initial assumption was that the dates referred to when they were taken rather than when they were uploaded. Upon closer examination however, and as you can see in the above compilation, the photos of Richman and Gay are presented as “undated”. Continuing on I found other pictures of the Richmans with upload dates well preceding the events in Sandy Hook, including one of Jeremy Richman, Jennifer Hensel and Avielle posing by a Sandy Hook fire truck from 6/8/2012. In these cases as well, the photos are presented as “undated” so we are left to assume that the dates actually refer to when they were uploaded to the AP Images site. As counterintuitive as it may seem I am not a terribly conspiratorial person. I tend to think there are simple explanations for most things that at first glance may appear quite difficult to explain. That being said I still wanted to hear from AP on this matter but I wasn’t especially suspicious. At least, not yet. I was speaking with a friend about the Sandy Hook Evidence:Strange Victim Photo Dates on the AP Images site and they suggested I check out one of the European repositories of photos, specifically, France’s, SIPA Press. Sipa Press in France is the leading photo agency distributing up to 6.000 newspictures every day to customers in more than 40 countries worldwide. They cover politics, economy, entertainment and sports. 20 million pictures are filed in Sipa’s archives and 12 million in its digital database. The editorial staff consists of 91 members, about 600 correspondents contribute to the service. Most significant partnerships exist with Associated Press, Rex Features in the United Kingdom and La Presse in Italy. Sipa Inc. in the US is a branch, which manages the distribution and production on the American market. Typing “Sandy Hook” into the search bar brought up 28 pages of search results listed newest to oldest. I skipped to page 28 and began working my way forwards, once again. And again, what I found was confusing, to say the least. As you can see from the above images all of the Hockley photos but one has a date of 6/15/2012. The other has a date of 11/23/2012. I’ll ask you to keep both those dates in mind as we look at some other photos. Above we have several photos of Sandy Hook victims, including Avielle Richman, 2 photos of Grace McDonnell, 3 photos of Victoria Soto and another of Dylan Hockley with apparent upload dates well preceding the event. But this is where it gets a little more confusing. In the above compilation you can see that the photo for Olivia Engel has a date of 11/18/2012. It also says that this is when the photo was taken. At this point it would be easy to assume that the photo dates relate to when they were taken, not posted, that is until you look at the dates of the other photos. Should this turn out to be a mistake of some kind this next series of photos won’t be the most egregious example but it is certainly the most confusing. An entire page of photos from around Sandy Hook Elementary and the fire station dated 12/13/12. While equally confusing this next compilation is far more egregious and far less easy to forgive. You may remember that early on in the Sandy Hook aftermath there was a photo released by media of victim Allison Wyatt. The only problem was the photo was actually of a little girl named Lily Gaubert who was alive and well. It is unclear how the photo came to be in the possession of media or how they made the mistake. Needless to say her mother was mortified. SIPA Press may not have exactly set the record straight but at least they don’t list Lily as Allison. Lily is between Allison Wyatt to our left and Madeleine Hsu to our right. Not only is Lily Gaubert listed as Madeleine Hsu but the dates attached to those photos (6/15/2012) coincide with one another. They also coincide with many of the dates of the Hockley photos. Surely we’re not supposed to believe that all those people/families had their photos taken on the very same day, are we? Even if we were to entertain that possibility how do we explain the date given to the erroneous Lily Gaubert photo? Since it was not provided by the family no one would have had any idea when it was taken. Frankly, I find the entire discussion most discombobulating. I will patiently wait to see if I receive a response from AP Images or SIPA press regarding these curious dates. If and when I receive one I will promptly pass it along. A member of the Sandy Hook Investigation Team has been kind enough to do some further digging into this topic for us. Thanks, Fred. 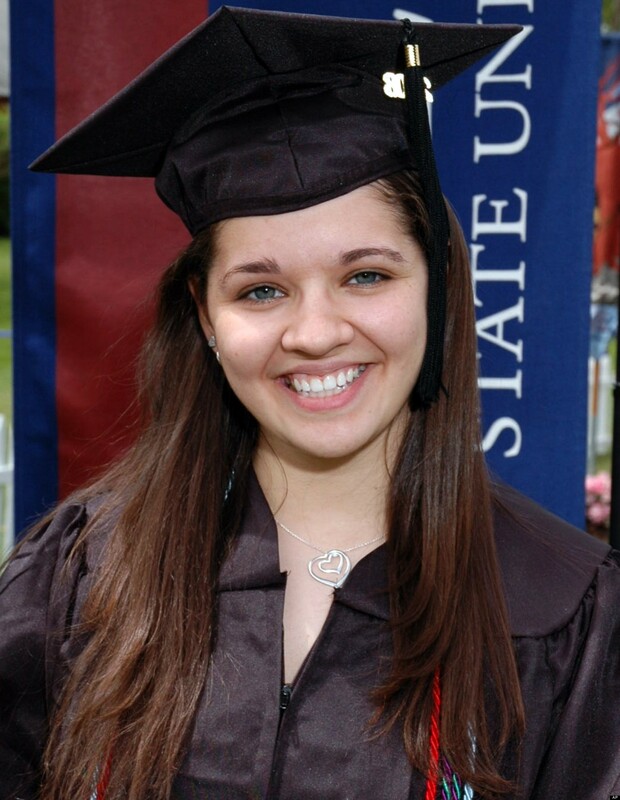 Fred was able to find the original Victoria Soto graduation picture featured in the Sipa images, above. As we can see from the insignia on her headgear the photo is from Vicki’s 2008 graduation. When we take that photo and insert it into Foto Forensics you can see that the creation date matches with a 2008 graduation. Special Instructions	UNDATED FILE PHOTO PROVIDED TO THE ASSOCIATED PRESS BY EASTERN CONNECTICUT UNIVERSITY. This 11/23/2012 date does, in fact, match the dates found on the images on both the AP Images site and Sipa Press. Thanks to a reader (SEO) in the comments section we now have the means to further confuse the situation. SEO pointed out that if we right-click on the thumbnails in AP Images we can bring up further information on the photos. If we right-click on the above thumbnail in AP Images this is the information with which we are presented. Special Instructions	UNDATED PHOTO PROVIDED BY THE AVIELLE FOUNDATION. I’m at a loss to explain a photo with a creation date of 2009 showing Avielle looking no younger than in her later photos. As of this writing I have still not heard from AP or Sipa in regards to my polite requests for information. I have followed up once with each. The AP site requires you to fill out a form when asking even the simplest of questions and I don’t have the time or patience to do it every time I want to follow up. Should you wish to make an attempt, here is the link for the AP Images info request page. Maybe you’ll have better luck than I. New video out from YouTube user Timothy Hunter that contains some terrific research and is, I think, a great companion piece for this article. What are your thoughts on Sandy Hook Evidence:Strange Victim Photo Dates? Are the dates easily explained or are they indicative of something more nefarious? I vote “indicative of something more nefarious”, but that’s just me. Thanks for the write up swansong, I hope an explanation is forthcoming from one or the other agencies. Thanks, Chum. No response from anyone so far but I’ll keep you posted . My experience going thru the Getty archives for photos of rock artists is that the dates/years are most often wrong. But these are older photos from the 60s and 70s. Sometimes they have a generic Jan 1st 1960 or 1970 even when the photos are clearly from later in the decade. So I would suggest it’s a bit of a grey area. I wouldn’t suggest that the dates mean these kids were in the system before the event date. They probably tried to pin point a date they were from, or perhaps the images even has the EXIF data present, and logged them to that date. How they got those dates, or even the photos…especially that one girl who turned out to be someone else…is the real questions that need to be addressed. Get to the source. Who logged these into REX/SIPA database?? I tend to agree. But as you say the photo of Lily Gaubert is a head scratcher. It’s the one that pushed me towards doing the article. Having said that, though…if they did use the EXIF data it stills seems odd that so many participants had pics taken the same day. Soto’s grad pic, for ex…I wouldn’t have thought grad would be in November so that would seem to exclude the “date taken” hypothesis…but I’m still open to an explanation. I am still waiting for word back from Sipa and AP Images. I still tend towards a simple answer but the longer I go without hearing from them the more curious I get. Thanks for the info and comments. Swansong, try this (if you haven’t already): On the AP site, choose an individual photo you have questions about, highlight or click on it and you should get more details on the photos. I didn’t find anything that clarifies or answers your questions, but maybe you will. Thanks for the heads-up. I actually hadn’t tried that…dohh. What I’m finding is raising more questions than answers. One photo of Avielle Richman is said to have been created in 2009 but she doesn’t look any younger than in the photos nearer her death. What would it mean if they had photographed all those children on the very same day? No doubt same photographer and camera. It takes time to put these big productions together. Well…I would think it means that we’re being played…lol. In don’t known what to think and AP and Sipa aint talking. I have to tell you…it’s really starting to piss me off that no one will respond to the most polite and direct questions. Not bing…not Sipa…not AP…not the Newtown Bee. I just wrote the Bee a couple of days ago and said that I really like the new look of the site changes but was disappointed that so many of the old stories seem to be gone…and I wondered if they would be put back on line. Nothing…not one word in response. I actually think she does look a few years younger in the 2009 photo. If someone downloaded (or uploaded?) a photo from another site, e.g. a photographer’s website, onto their own computer, would the date of creation change to the date it was downloaded? I don’t know how those things work. Ehh, you may be right. Neither facial examination or photo forensics are my strong suits. I was actually thinking I’d get a quick and satisfying response from Sipa or Ap and have it sorted out in no time. So far…nothing. I looked at SIPA and AP sites and found a few pictures that were dated 12/12/12 along with all those you found with a 12/13/ date. What I noticed about the photos with the pre-shooting dates is that they were not used in the media, that is to say, I had never seen them before. Could it be that the date was changed when the photo was used and those that were not used retained the 12/12 or 12/13 dates? It think it is quite possible that pictures of drill participants were taken on 12/12 and 12/13. Three days of photos would help explain why we can always see the long row of State Police vehicles behind the firehouse in many photos and the helicopter footage, while they are the background for several “grieving parent” shots. I’ve even thought that some of the interviews were conducted before the 14th – Sibley and Cox are two that come to mind – that would explain why discarded elements turned up later. One interesting photo with a 12/12 date shows the McDonnells talking to a woman who looks like Laura Phelps. The caption refers to “teachers walking away from the school”, but the three are the only ones in sight and don’t appear to be going anywhere. Another search term – Connecticut Shooting – brought up two AP photos on SIPA with a 6/12/12 date. The photos were identical with a caption explaining that the Monastery of the Holy Spirit in Georgia had rung its bells 28 times rather than just 26 so that all of God’s children would be included. However, they were mourning the deaths that occurred at the Connecticut school on Friday, December 21st! Something else I forgot to mention – when using a photo from an earlier time, it is referred to as a “file photo” and the date is the file date. An example would be a photo of the President of Australia who commened on Sandy Hook in December but stories used a file photo of her from June. This is a sharp analysis. Jack is supposed to be the older brother, but obviously he is much younger then Dylan in both pictures! I see they have now pixeled out Dylan’s brothers face so you can not see that his older brother is actually younger. In addition, Dylans full name was Dylan Christopher Jack Hockley? Why would you give 2 brothers the same names? I wondered about the photos as well, especially in light of the “Super Bowl” Newtown Children’s Choir, where it appears the “dead” children are really alive and well and a few years older than the pictures that were used in Sandy Hook shootings. Also wasn’t Eric Holder in Newtown on 11/23/2013 for some kind of meeting? But he was in Newtown less than a week after the Event. Hi, I just realized that I might be a little confused. Is the creation date the date it was registered on the site or the date the pic was taken? If that pic was taken in December… why is the sun out? Where’s the snow? I know the weather’s been confused over the recent years but I see green bushes or trees behind her… what’s going on? Well that’s the $64,000 question, isn’t it? Neither of those sites ever returned my messages…but my working theory/assumption is that those are the creation/registration date. Hell if I know “what’s going on”. None of it makes much sense and no one is talking. Keep on it – would love to know what the outcome is. I’ve tried intermittently sending follow-ups but no one will respond. You may have noticed that Sipa now requires you to sign-up to browse the photos. Perhaps if they were email-bombed or something…they might respond. Born July 3, 2006 Yet her pic is dated June 15 and she is sitting in front of her birthday cake with six candles. How could the picture be taken or uploaded on June 15 when her birthday is July 3. Why do some folks feel that all things are done merely for money? Here we have a complex and dirty event replete with all sorts of intercurrents and all we can say “they did it for the money”? Did the gubbermint do it for money, too? Assuming money is the most important aspect of this event only serves to trivialize the obvious fact the huge numbers of false flags popping off like popcorn is far more than just people looking to make some shekels. When you think false flag, think Tavistock, think DHS, FEMA, Obama and his cast of characters. These events are testing the citizenry for the next step in our takeover and demise. NWO is just around the corner and these false flag building blocks are meant to predispose us to accepting the shattering loss of our freedoms one by one. They prove that Americans are the most gullible oafs on the planet. I went to the AP site and did a little snooping on stuff I know,just to check dates and it is weird.I found two different events where the photo pic was dated right but down under one was dated the day before and another dated a few months before actual date of photo.I tried to call but got disconnected four times so I emailed AP to ask about this,so far no reply. Be sure to let me know if you hear back from them. I will.I also came across what I think are very telling photos of the Parker girls awhile back.I posted them to SHH FB page wanting others take on them but FB deleted them and sent me a warning.They removed them very quick,no one had a chance to look them over. Way to go, Valerie! I tried to snoop on the AP site as well, but just ended up more confused. v.v I did email AP and sipa though. I’ll also inform you guys if they reply. Hopefully everyone who reads this article will do the same! It only took me 2 minutes. I’ve been trying to play the devil’s advocate in regards to this article b/c I wanted to see if it could be debunked by a nonbeliever… It’s the biggest piece of evidence I’ve found, and I had to make sure that it could stand alone as a valid slice of proof that Sandy Hook is a hoax. From what I’m noticing, the AP images can currently be explained away. I cannot factually explain why the word “undated” is used obsessively b/w AP and sipa though. However, due to the fact that the photos were provided by the families, they may have wanted it considered “undated” to the public eye. AP may’ve only written the date (the date the photos were created) to keep things… tidy and organized. The example I’ll use is Avielle (the most shocking to me). It was added by the Avielle Foundation and was instructed to be undated. It was created in 2009, but added to the library on April 15th, 2013, as this article states! They labeled it based on when it was taken rather than when it was submitted. The same can go for the photos of Josephine Gay as well. Victoria’s photo can’t easily be explained away, I’ve tried. On the AP page, the photo starts with FILE which means that it was taken from an earlier date, verifying that it’s originally from 2008. Eastern Connecticut University submitted it with requests that it be labelled “undated.” I will assume this was meant for the public. The question now is, was this photo filed away and scanned to the internet by the University in November for some reason? I can’t find a reason for why it’s creation date is 11/23/12. So this one is definitely a question mark. I cannot explain why Lily is in the photo gallery. She remains the missing link, yet again. These photos only have a year on them, 2012. All of sipa’s photos have the year, day, and month whether they’re labelled undated or not. So, from that angle, they had to give those pictures Some date, since Rex didn’t hAve a date on them! I was thinking that’s why sipa gave a lot of the photos the same date of 6/15/12. Unfortunately, that sounds extremely irresponsible for a renowned photo repository. Lol…you sound as confused as I was when I wrote the article. Its one of those things that no amount of thought will help. Without further info from AP or Sipa we don’t have enough to answer our questions…and…as you noted you now need a membership just to view images. Funny how that happened, eh? I added a new video to the article. It goes over this article and adds some extra information from the creator’s own research. Thanks for your comments and do be sure to let us know if you find anything else on your search. @swansong i just want to see the video of him coming in the door, if that happened. I think Alex Jones uses AP photos on the Infowars site. If so, he must be a member, right? You might try contacting him and having him dig deeper on the date thing. Anything happen with Alex Jones, AP or anyone?